It occurred to me that if you can make lemon curd and custard in the microwave, then you could probably make crème pâtissière in a similar way. Here’s my microwave adaption of Dorie Greenspan’s pastry cream recipe. Spoon this pastry cream into a prebaked tart shell and top with fresh berries for an elegant fruit tart. I’ve also made chocolate pastry cream by adding sifted cocoa to the milk before heating. I’m trying not to think about all the possibilities – profiteroles, danishes….hmmm…. Edit: I’ve just made a half batch of this recipe and it worked very well. Reduce the microwave times accordingly – in my micro, Step 1 took 1 minute, and Step 3 took 1½ minutes on high in 30 second bursts. That is a lovely photo with those gentle swirls. Maybe this is the year I finally try to make profiteroles…do you have a fool proof easy way of making choux pastry as well? Jo, Dorie’s recipe is excellent – I’ve used it to make gougeres before (though haven’t tried the regular choux pastry). You are too clever. 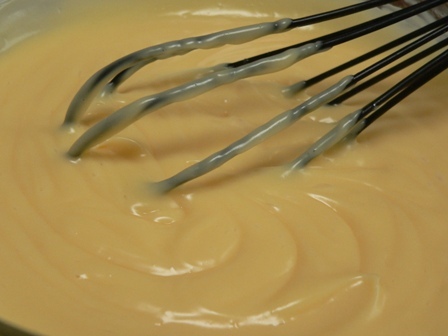 By the way, I used your microwave custard recipe last night and then stirred some chocolate through it – very popular! Chocolate custard! Richard Bertinet has a nice recipe for chocolate buns – he uses the sweet dough recipe and then makes pastry cream with cocoa in it (add the cocoa to the milk before you heat it). Then he makes scrolls with the chocolate pastry cream and chocolate bits rolled into it. It’s a messy job, but delicious! What perfect timing – about to make a plum tart as my plums didn’t reach jam level but stayed at the compote (stewed) stage. They are also slightly caramelised which was also unplanned. Am also a cheat on the pastry and have bought it ….from the supermarket…. They sound delicious, Anna – caramelised plum compote! :) Love your blog, btw, I feel like I’m right there in Paris with you.. This is so exciting! I never would have even thought to attempt to make the pastry cream in a microwave oven, but you can be sure that I’m going to try it now. Thank you! Ah the joys of microwave cooking. I wish they were more predictable though. Sometimes things take 30sec … sometimes 40sec, or maybe it is just me! A small voice here reporting that someone wasn’t paying attention and accidentally put the yolks in at the start. This is not a good shortcut. Thanks…need I say more. Life does get easier with people like you Celia: First homemade pectin now this….Thank you! wow – my children were at the supermarket yesterday and saw eclairs that they wanted me to buy – naturally i did the ‘mum could MAKE them and they would not have preservatives and would TASTE better’ line. so rainy Sunday sees us cooking! I have just made the creme and everyone is anxiously waiting for it to cool to fill the puffs! thanks Celia – it looks exactly right. taste gorgeous (and i used your recipe for homemade vanilla extract!) and a lot less mucking around than the stove top version.